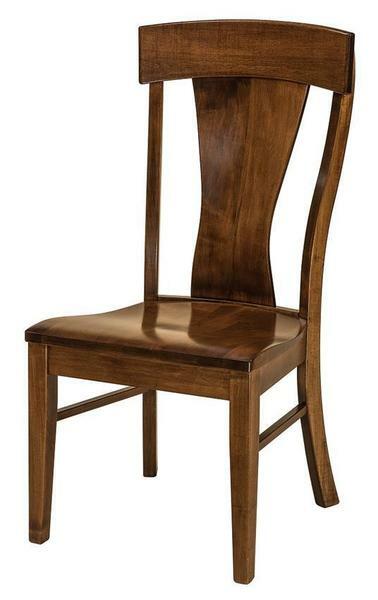 These are included in the top 10 best selling Amish dining chairs! An exquisite choice for your dining room furniture collection, the Amish Ramsey Dining Chair contributes its contemporary shape with style and grace. A curving back splat will attract attention as it supports friends and family in the ultimate comfort. Watch your dining room sparkle with these Amish made dining chairs creating a contemporary look you'll love. With each dining chair made here in America by the Amish, your dining room set will serve you well and be a source of pride for years to come. The Ramsey is shown here in brown maple wood with nutmeg stain. Brown maple wood is hard and durable to create a strong chair while its grain is sleek and smooth, displaying stain or paint exceptionally well. We offer the matching Amish Ramsey Swivel Bar Stool and the Amish Ramsey Stationary Bar Stool for matching seating throughout your dining room and kitchen. For a modern look with strong lines and a smooth form, the Ramsey is the perfect choice.